Don’t let Oedipus obliterate the memory of Laius! Hard to be the son of a famous composer and a composer yourself – Franz Xaver Wolfgang Mozart (link will open a new tap to Wikipedia if you have no idea who that is) and Siegfried Wagner wouldn’t say the contrary. But sometimes it works, and the sons of Bach (Wilhelm Friedemann, Carl Philipp Emanuel and Johan Christian) enjoyed even more popularity during their lifetime than their dad, considered too conservative and austere by late-18th century tastes. They may not be today considered anything near the towering Johann Sebastian, to whom all music leads and from whom all music derives, but they are still abundantly performed and recorded today, not just as “sons of”, but for their own merits. And sometimes the Oedipus struggle turns to the disadvantage of the father, the son becomes so famous that he all but blots out the memory and reputation of his dad – wonder what Leopold Mozart would have to say about that. And who even remembers Johann Ambrosius Bach? Hendrik and Louis Andriessen offer a similar case. Mention “Andriessen” to a music connoisseur and the chances are he’ll respond “Louis”. Louis has become one of the most influential figures on the Dutch musical scene today, both as a composer adept of minimalism, with pieces like De Tijd (Time), De Staat (The Republic) or Hoketus that are much performed, recorded and feted, and as a composition teacher at the Conservatory of The Hague. But look at the programs of the Amsterdam Concertgebouw Orchestra (like the New York Philharmonic, they have a great online archive), and from 1933 to 1980 it is filled with the name Hendrik Andriessen – 136 concerts with music of his (then there’s a gap and five isolated concerts in 1999 and 2002). By comparison, between 1961 and today, Louis gets… eight. Of course, part of that comes from the fact that Louis, as an “enfant terrible” of the Dutch music scene, eschewed the large and traditional symphonic forms (although he is famous for disrupting once, in 1969, with like-minded radicals, a performance of the Concertgebouw Orchestra, to demand that it programmed more of their works, see this). But nevertheless: had you asked in the 1930s to 1970s about composer “Andriessen”, music connoisseurs would probably have responded “oh, yeah: Hendrik”, and had you mentioned his son, they probably would have raised a doubtful and condescending eyebrow: “oh really? The son’s a composer too? Well good luck…”. Now, you see the name Hendrik, you’ve go to go to Wikipedia to check who that was in relation to Louis. In fact, like the Bachs, the Andriessens are a very musical family, Hendrik had a brother, Willem (1887-1964), who was also a composer (24 entries on the Concertgebouw’s concert archive, from 1909 to 1949), and another son, Jurriaan (1925-1996), who was also a recognized composer (he gets more entries on the Concertgebouw archive, from 1949 to 1972, than his brother). And then, to make things really simple, Hendrik had another son, Nico, an architect, who gave birth in 1951 to a son (Hendrik’s grandson then, Louis and Jurriaan’s nephew) and he found no better idea than to call him Jurriaan like his uncle. Jurriaan Jr died at the untimely age of 40 and was mainly a graphic artist, but also an autodidact composer, his main work being a portrait of his companion Hedwig whose lines are in fact notes of music on staves, thus forming a score, which has been recorded, do records 008 (2003) (which I have, and hope to review soon). More about Jurriaan Jr on the website devoted to him. 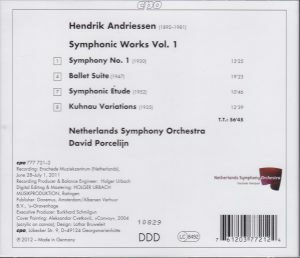 Hendrik had been featured on CD already, both through reissues of various historical recordings and with modern recordings published by NM Classics or Olympia, but Cpo’s three-CD series of his Symphonic Works offers the welcome opportunity to explore thoroughly his orchestral output. Symphony No. 1 was completed in 1930, although it was “in the works” for twenty years. It is beautifully late-romantic, hugely dramatic. The liner notes refer to Roussel, reporting how highly Andriessen thought of his music, but if indeed Roussel I hear in the symphony a mixture of the motoric Roussel of the 3rd and 4th Symphonies, and the searingly romantic Roussel of the 1st and 2nd Symphonies. The Ballet Suite was written in 1947, with no specific ballet project in mind, just because Andriessen wanted to write something lighter and more choreographic than his hitherto customary fare. There’s no specific plot, it’s an abstract ballet and Andriessen called for the choreographer to let the dance arise from the music – quite modern in 1947, and Balanchine comes to mind. In conformity with the project, its moods are more light-hearted and “scherzando” than in the Symphony, which doesn’t preclude moments of drama. It is orchestrally lush, not “modern” stylistically – not even, to carry on with the Balanchine analogy, in the manner of Hindemith and Stravinsky, more Roussel again and D’Indy as the liner notes appropriately point out (and the beginning of the 2nd movement sounds very much like Ravel’s Daphnis). Reflecting on the music of Andriessen and asking myself why, after being so popular during his lifetime, he is now almost completely forgotten in favor of his son, sure, I can come up with the following answer: as well-crafted and dramatic as it is, there’s nothing particularly original in his music. You can listen, enjoy while you are listening, but there is nothing that puts it apart from the well-crafted and enjoyable stock-and-trade of its time. Listen to Stravinsky or Hindemith or Britten or Bartok or even Martinu, it isn’t cutting edge modernist but it is uniquely the voice and style of these composers (or styles in the case of Stravinsky). And, yet, the music is highly enjoyable while you are listening. Symphonic Etude (1952) is the most advanced piece on the CD, its slow introduction bringing to mind Schoenberg (and only after noting this do I read in the liner notes that it is indeed a twelve-tone theme, when Andriessen had decided to explore the melodic aspects of Schoenberg’s compositional technique), and the dramatic explosion which occurs at 2:45 evoking the music of 20th century American symphonists like William Schumann. The piece develops a single melodic theme in a slow-fast- slow-fast architecture, and it is extremely effective. Variations on a theme of Kuhnau (ended by a double fugue), from 1935, is the piece that established Andriessen’s standing in the Netherlands. Kuhnau was Bach’s predecessor in Leipzig and the anecdote is that Andriessen picked up the theme of that keyboard piece of Kuhnau because his daughter was rehearsing it at the home piano. It is scored for strings alone, and it is a magnificent score, that would not seem like the ugly duckling in a similar program with, say, Bartok’s Divertimento, Honegger’s Second Symphony, Vaughan Williams’ Tallis Fantasia and Michael Tippett’s Fantasy on a Theme of Corelli. I have alternative versions of the Kuhnau Variations: one, a studio recording made for Philips in 1952 by Willem van Otterloo with Residentie Orchestra of The Hague, reissued on the invaluable and now hard to find Challenge Classics 13-CD set of Willem Van Otterloo “original recordings 1950-1960”, CC 72142, barcode 608917214222, and the other by the same orchestra under Ferdinand Leitner, on volume 5 of Olympia’s fine series 400 Years of Dutch Music, OCD 504, barcode 5015524005047 (Olympia is unspecific about the recording date, 1978 or 1979). One other recording of the Symphonic Etude too, by the Concertgebouw under Kondrashin in 1979, on Donemus / Colofon’s great series devoted to the 100th anniversary of the Concertegebouw Orchestra/Netherlands Music, CVCD 9, no barcode. Porcelijn does justice to the pieces, slightly less intense than Leitner and significantly less than Van Otterloo in the slow variations (despite – or because of – the latter’s mono sonics) but slightly more dynamic and lithe in the fast one and (compared to Leitner, not Van Otterloo) in the fugue, with less energy than Kondrashin in the explosive second section of the Etude (but more precision), slightly more dynamism in the final section (8:23), and much gloomier than him at the return of the introductory slow section at 4:26, turning an 8-minute composition into one running nearly 11 minutes. See also my reviews of the two other installments from this valuable series from Cpo, Symphonic Works volume 2 (Symphony No. 2, Ricercare, Mascherata, Wilhelmus van Nassouwe). 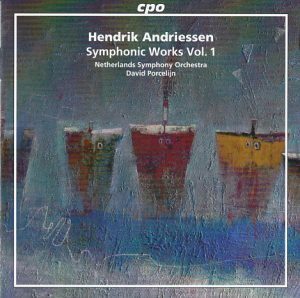 Netherlands SO, David Porcelijn, Cpo 777 722-2 (2013), and Symphonic Works volume 3 (Symphony No. 3, Symphony Concertante, “Chantecler” Overture). Netherlands SO, David Porcelijn, Cpo 777 723-2 (2015), and for more CDs of the composer, go to my Hendrik Andriessen presentation page. TT 56:45. The music of Hendrik Andriessen is worth the exploration. Don’t let Oedipus completely obliterate the memory of Laius!